As if it wasn’t enough to master (chief) the console – hit the right buttons, fight giant rats carrying guns, lose my way from one dead end into another, bump into random coffee machines – not to mention that left brain/ right brain manoeuvrability – or lack thereof – and what’s with that stale socks smell! How was I to know there is a whole set of ‘in house’ rules that go with the gaming ethos? 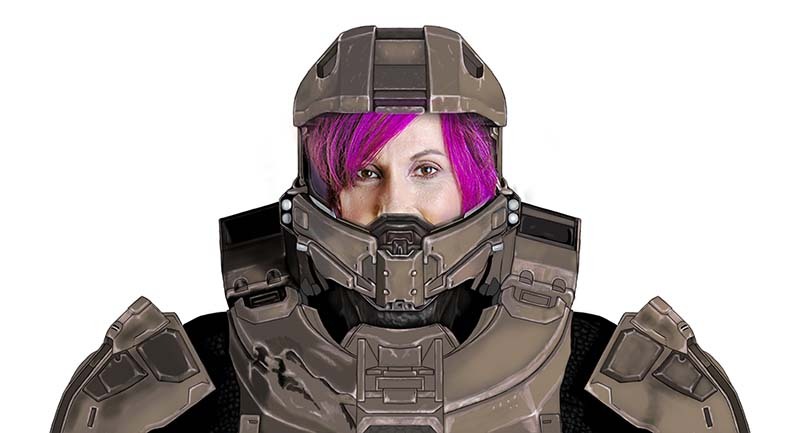 – Make fun of master chief’s name UNDER ANY CIRCUMSTANCES!!! born to the human race!!! I broke every rule – every single one! I haven’t had that much fun since my school days. But I am paying for it now. I have lost my Halo. In this week’s episode of Reel Time I get told. If I want to continue with my byte lights crusades then I have to tone down the mega wattage and behave. If I want to be allowed back in the gaming room I had to agree and come quietly. I will be allowed to play something, simple. My only request was that the new game was not a car race. My request was met with a lowered brow and an eye glint. I am worried – very worried. Did you know that Halo 5 is being released soon? Totally – right! Apparently – it appears as if – Master Chief gets ‘done over’ in the next Halo makeover! What – but he’s the main character – you can’t take him away from us – WE HAVE BONDED! Who do these writers think they are – manipulating characters and plots as if they have a right?